What ever happened to snowlover? he seemed so interested in predicting arctic sea ice extents and now; nothing from him. I wonder why? I wondered that myself when I saw this story. Good riddance to the denialist, whose rehashed arguments were untenable more each day. 2012 is a genuine record low for Arctic Sea Ice over the last 30 years, 2011 had conflicting places for the minimum sea ice extent. It should be interesting to see the studies on the 2012 record low, and how much natural variability played in relation to regional climate change in the Arctic. A large chunk of the sea ice melt occured with a very strong area of low pressure that significantly compacted the ice. It should also be noted that the southern hemisphere experienced it's 2nd highest ice extent on record about a week ago. small technical point; Isn't it winter in the Antarctic now? and don't we know why antarctic sea ice is expanding in the summer anyway? Does that mean there was less sea ice in 1982? Extent is area not volume. Volume would be the determination of amount. There was more Arctic Sea Ice in 1982. There was probably slightly less Antarctic Sea Ice in 1982 than there is now. However, there were periods in Earth's History with significantly less Sea Ice than today, making this current period not very unusual (Funder et al. 2011). Some people try and argue that it's the Ozone Hole that has created circulation changes that have managed to cool Antarctica over the last 30 years, but I don't buy that explaination, especially since the Ozone Hole has recovered somewhat recently, and we have continued to see an increase in Antarctic Sea Ice. Perhaps it is the same reason for why the Arctic Sea Ice is declining... the oceanic oscillations. I am as always not convince by pretty graphs, also it is a graph of a range of simulations. Very ropey. How does the sea shell evidence hold up? I think that the circulation changes are what has insulated Antarctica (apart from West Antarctica) from global warming explains well the (geographical) distribution of the sea ice build-up and loss in Antarctica. I believe that there is evidence that ozone plays a part in the circulation changes, but also evidence that it has not. but I don't buy that explaination, especially since the Ozone Hole has recovered somewhat recently, and we have continued to see an increase in Antarctic Sea Ice. Depending on your meaning of "somewhat". It is still near the deepest and and largest it has ever been, give or take only a few percent, whereas the minimum O₃ concentration in the hole is still half what it was in 1979. I believe the cause of the declining Arctic sea ice is much less complicated. It is attributed to anthropogenic global warming. 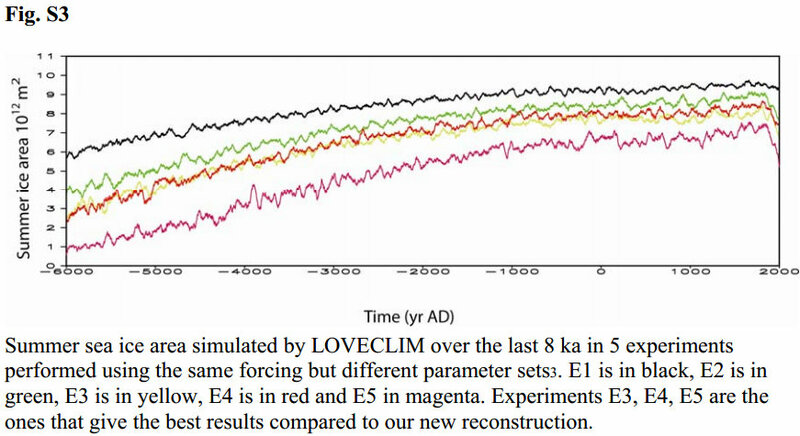 If it were due to oscillations, it would be oscillating, not declining. Last edited by Bored Wombat on Mon Aug 27, 2012 9:16 pm, edited 1 time in total. This change in turn may already be disturbing the jet stream, the high-altitude wind that separates southern warm air from cold Polar air. A destabilized jet stream becomes more 'wavy', allowing frigid air to plunge farther south, a possible factor in the extreme winters that were experienced all around the Northern Hemisphere in recent years. Another side-effect is that as the jet stream waves become larger, they slow down or even stall at times, leading to a significant increase in so-called blocking events. These cause extreme weather simply because they lead to unusually prolonged conditions of one type or another. The recent prolonged heatwave, drought and wildfires in the USA are one example of what can happen; another is the cool, dull and extremely wet first half of summer 2012 in the UK and other parts of Eurasia. bump this to the top because it's very important at the moment. The National Snow and Ice Data Center in Colorado announced that Arctic sea ice had shrunk to 1.58 million square miles, the lowest expanse recorded since satellites began taking measurements in 1979. That breaks a record of 1.61 million square miles set in 2007, and the shrinkage appears to be continuing: Ice is expected to keep melting through September. Ozone may have contributed to the cooling of Antarctica, but I think that we need to understand all of the processes first, before we say things with absolute certainty. Stratospheric Temperatures have started increasing recently (since 1995) which could represent a recovery in the Ozone Layer (Liu and Weng 2009). I also think that Ozone Depletion is far more complicated than what most people make it out to be. Anthropogenic CFCs had played a major role in Ozone Depletion, but there were also major natural components like Solar Proton Storms that also depleted the Ozone layer. I think that most of the warming in the Arctic is probably due to regional climate change up there amplified by Arctic Amplification, but you can not deny that natural variability has played a significant role in Arctic Sea Ice depletion. Various studies that I have read estimate the contribution from natural variability to sea ice decline to be around 40-50% or so.